This door is exactly as it looks! Works great in our tub/ shower! Was easy to install aside from drilling through existing tile. Opens up the room compared to our old rimless glass sliding door. Easy to wipe and keep clean! We did not add the stripping on the hinge side or bottom as the water does not get by either of those areas. WOULD DEFINITELY RECOMMEND THIS DOOR!! 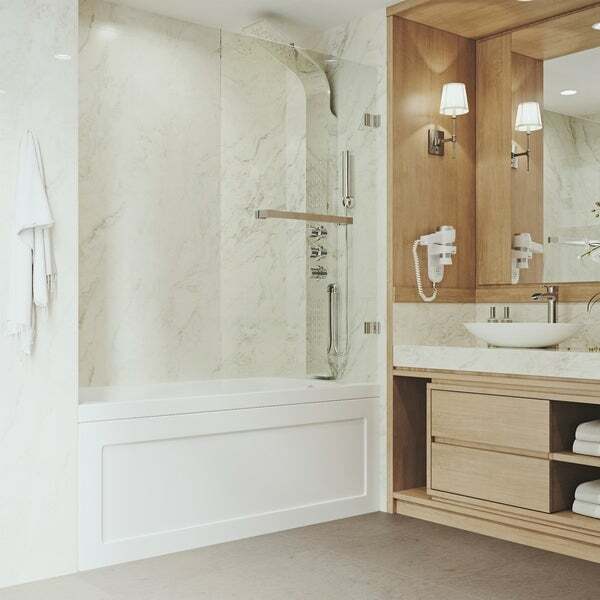 Constructed of 5/16 inch clear tempered glass, the VIGO Rialto Bathtub Door features continuous seal strips designed to keep water inside the tub, even through the door hinges! Keep this frameless door in place while you shower, then swing it neatly out of the way to use the bathtub. Its convenient towel bar and rust-proof hardware ensure its durability and beauty in your modern bathroom. Dimensions 34.0 In. X 57.38 In. Installed this in a house that only had one bathroom on the main floor so wanted to do something more than a shower curtain. Makes the bathroom seem larger to have glass instead of a curtain. Happy with the look. Love, Love, Love this bath tub door1!! This is the second one that we have purchased...so much better than using a shower curtain!!! Clean lines, easy to wipe clean...I highly recommend!!!! "Can this be used with a smaller 54X30X19 bathtub? Thanks." "Is there a stationary panel? Does this have to be drilled into a tub? Is there a chrome option? How far does door open....90ÃÂ° or more?" This is one swinging panel. Hinged to wall. 90 degrees out of tub. This door measures approximately 34 inches wide x 58 inches high x 0.3125 inches thick. "Can this door swing both in and out"
The shower door can open to the left or right depending on user preference.